“While the Hausas in each town and village in the North know what happened in their own localities, only the Ibos know the whole terrible story from the 600,000 or so refugees who have fled to the safety of the Eastern Region – hacked, slashed, mangled, stripped naked and robbed of all their possessions; the orphans, the widows, the traumatized. A woman, mute and dazed, arrived back in her village after traveling for five days with only a bowl in her lap. She held her child’s head, which was severed before her eyes. “But from what I have been told on my journey by chartered plane to towns to which the North civil airline would fly, and hitching a lift through this desolate land, the horror of the massacre at times seems to equal that of the Congo. I do not know if there are any Ibos left in the Northern Region…for if they are not dead they must be hiding in the bush of this land which is as big as Britain and France. I saw vultures and dogs tearing at Ibo corpses, and women and children wielding matchets and clubs and guns. I talked to three families who fled from the bush town of Nguru, 176 miles north of here [the dispatch was datelined Lagos]. They escaped in three Landrovers from the town where about fifty Ibos were murdered by mobs drunk on beer in some European shops. Another Englishman who fled the town told of two Catholic priests running for it, the mob after them. ‘I don’t know if they escaped; I didn’t wait to see.’ … A lot of the massacred Ibos are buried in mass graves outside the Moslem walls. In Jos charter pilots who have been airlifting Ibos to Eastern safety talked of at least 800 dead. “The massacre began at the airport near the Fifth Battalion’s home city of Kano. A Lagos-bound jet had just arrived from London, and as the Kano passengers were escorted into the customs shed a wild-eyed soldier stormed in, brandishing a rifle and demanding ‘Ina Nyamiri’ – the Hausa for ‘Where are the damned Ibos?’ There were Ibos among the customs officers, and they dropped their chalk and fled, only to be shot down in the main terminal by other soldiers. Screaming the blood curses of a Moslem Holy War, the Hausa troops turned the airport into a shambles, bayoneting Ibo workers in the bar, gunning them down in the corridors, and hauling Ibo passengers off the plane to be lined up and shot. From the airport the troops fanned out through downtown Kano, hunting down Ibos in bars, hotels, and on the streets. One contingent drove their Landrovers to the rail-road station where more than 100 Ibos were waiting for a train, and cut them down with automatic weapon fire. The soldiers did not have to do all the killing. 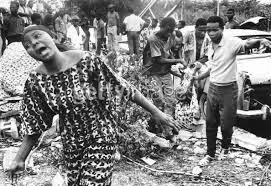 They were soon joined by thousands of Hausa civilians, who rampaged through the city armed with stones, cutlasses, matchets, and home-made weapons of metal and broken glass. Crying ‘Heathen’ and ‘Allah’ the mobs and troops invaded the Sabon Gari (strangers’ quarter) ransacking, looting and burning Ibo homes and stores and murdering their owners. All night long and into the morning the massacre went on. Then, tired but fulfilled, the Hausas drifted back to their homes and barracks to get some breakfast and sleep. Municipal garbage trucks were sent out to collect the dead and dump them into mass graves outside the city. The death toll will never be known, but it was at least a thousand.